In the spirit of Halloween, this month’s Guest EVA features a spooky Poltergeist-themed article from former Fed insider, Danielle DiMartino Booth. In her letter, Danielle warns that signs of stress are starting to show in the $200-plus trillion corporate bond market and the conditions are now in place for the next corporate default cycle (which is clearly underway in the energy and mining sectors). If she’s right, the damage we are already seeing in both investment grade and high yield spreads* tells a scary story for the richly-valued S&P 500, which continues to rally in the face of rising risks already reflected in the credit markets. To be clear, my colleagues and I at Evergreen GaveKal are not suggesting that investors should avoid all high yield bonds. Rather, we believe investors should be selective and focus on higher-grade, high yield securities (BBs instead of CCCs) at this point in the credit cycle. While spreads may continue to widen in less beaten-up sectors, we believe stocks have much further to fall than corporate bonds. Given the defensive posture our investment committee has taken over the last year – with relatively low allocations to equities and junkier-rated bonds and the highest cash reserves in our firm’s history – we believe we are well prepared to weather whatever storms may come. *The yield difference between lower-rated corporate bonds and US Treasuries. In the spirit of Halloween, this month’s Guest EVA features a spooky Poltergeist-themed article from my good friend and all-around smartest person in the room, Danielle DiMartino Booth. During her eight years in the Federal Reserve System – where she worked from 2006 to 2015 as a senior advisor to Dallas Fed President, Richard Fisher – Danielle was one of the only voices inside the Fed to warn or even acknowledge how rising defaults in subprime mortgage loans could destabilize the entire US financial system. Thinking the subprime threat had been successfully “contained,” the Federal Open Market Committee (FOMC) fell desperately behind the curve. And in hindsight, the Fed only “saved” the economy from a Great-er Depression scenario by employing an experimental combination of zero interest rates and massive monetary expansion… which, in turn, set a new and even less predictable credit cycle in motion. Like the avaricious real estate developer in Poltergeist (the 1982 classic, not the 2015 flop), the Fed chose to build yet another credit expansion on cursed ground instead of cleaning out the graveyards of capital misallocated in previous cycles. Seven years later, Danielle is warning that the conditions are ripe for yet another meltdown – this time emanating from the $200-plus trillion corporate bond market, where dealer liquidity has evaporated as a result of post-crisis regulatory reform and where the total debt stock has grown by more than 55% since early 2011. 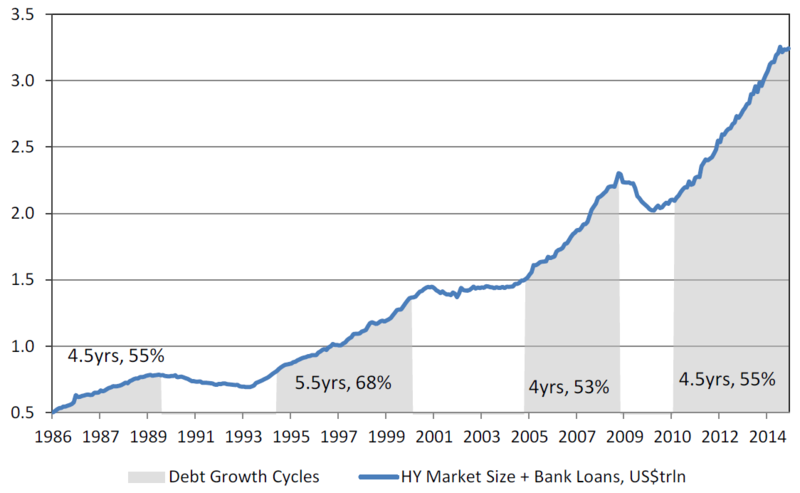 As you can see in the chart below, the combined growth in US bank loans and high yield bonds over the last four and a half years now ties for the second longest and second largest credit cycle in the past three decades. Source: Deutsche Bank’s Melentyev & Sorid, “The Evolution of a Credit Cycle.” October 2, 2015. What’s more, low quality borrowers (with CCC credit ratings or lower) account for roughly 17% of total debt issuance over that timeframe. So far, this cycle falls just short of the mid-2000s at 18% and the late 1990s at 20%, but give it time. In another year – if Ms. Yellen has her way – we could be looking at the longest, junkiest credit expansion on record. Then again, the clock may already be running out. While equity prices continue to rally, the steady rise in even AAA corporate bond spreads* may signal – like thunder in the distance – that a storm is coming for risk assets. This divergence prompts a critical question. Do you believe the equity market? Or the bond market? * The yield difference between lower-rated corporate bonds and US Treasuries. It’s worth noting that whenever the corporate bond market and the equity market reflect dramatically different views on risk, bonds are very often right. And by the time high yield spreads really start moving, it’s often too late to react. As you can see in the chart above, high yield spreads in the energy and mining sectors (which collectively account for nearly 20% of outstanding junk bonds) have already blown out to levels last seen during the Great Recession, reflecting elevated default rates in the high single digits. With defaults still running below 3% in the overall high yield market, it would be easy to dismiss the distress in commodity-related sectors as isolated events; but not only are spreads creeping higher in non-commodity sectors, qualitative signs of stress are clearly beginning to show in firms that should be benefitting from low commodity input costs (e.g. Walmart). There is clearly more to this story than the largely priced-in resource slump. Danielle argues that it’s just a matter of time until the accrued policy errors of decades past come screaming back to haunt the Fed and the broader financial markets alike. With the historical prerequisites in place, the next default cycle could happen any time (and is clearly underway in resource-related sectors). All it takes for that stress to jump to non-resource stocks and bonds is a spike in volatility… like the kind we saw on August 24 when the US equity volatility index temporarily jumped from 28 to 40 in the largest week-over-week spike on record. From that perspective, credit markets, equity markets, and even the broader economy may be heading for trouble. To be clear, my colleagues and I at Evergreen GaveKal are not saying that investors should avoid all high yield bonds; but we do believe investors should be selective and focus on higher-grade, high yield (BBs instead of CCCs) at this point in the credit cycle. While a lot of the damage has already been done in certain corners of the income world, we could still see significant spread widening in less beaten-up sectors. And with income-oriented assets already pricing-in far more stress than the seemingly care-free S&P 500 is even acknowledging, the equity market correction may not have fully run its course. We realize many clients need income and can’t afford to move heavily into cash or US Treasuries; however, having unusually high reserves is advisable given the increasing amount of spooky developments we are seeing these days. As I argued in late August (“Don’t Panic… Just Yet”), investors may still be able to squeeze a bit more return out of growth-oriented portfolios as the thunder draws nearer, but you don’t want to be over-extended when the “they’re here” moment arrives. With that have a Happy Halloween and let’s see what Danielle has to say. To this day, I still count by the flash of lightning and the thunderclap to guesstimate a storm’s distance. To this day, I make sure all trees are trimmed to be absolutely positive they’re clear of any window in my home. Such is the impression Poltergeist left on yours truly’s psyche back in 1982. For those of you who need reminding, Robbie, the name of the character who played the son in Poltergeist, would count the seconds between the lightning and the crashes of thunder for comfort knowing that the longer the pause, the more distant the storm. In the end, as the unsettled spirits rose through the floorboards beneath which they were buried, the time spans grew frighteningly shorter, culminating in Robbie’s being snared right out of his bedroom by a possessed tree. Though Robbie was rescued from the storm’s grasp, his fictional sister Carole Anne was not so lucky. The demons in the TV grabbed her very body and soul and didn’t let go until her determined mother went into the netherworld to get her back. For the credit markets, the storm sounds as if it’s closing in. In a genuinely spooky “They’re here” moment, just last week, Zero Hedge broadcast the news that the UBS Managed High Yield Plus Fund had announced it would be nailing the doors shut and liquidating their holdings. Slowly. The doomsday blog warned that the illiquidity Minsky Moment was finally knocking on hell’s door; big banks’ bond inventories have been decimated and funds’ ability to liquidate in an orderly fashion would be stress-tested and fail. Forget for a moment that UBS is also the name associated with the first stressor to emanate from the burgeoning subprime crisis. This fund, which opened to investors in 1998, had survived both the dotcom bubble bursting and the credit collapse that accompanied the subprime crisis. There’s no doubt the time should be nigh. Credit spreads, a measure of the extra compensation over Treasuries investors command for the risk of taking on corporate credit risk, for both high grade and junk bonds have gapped out in recent months. Investors are now demanding seven percentage points above comparable maturity Treasuries to hold the riskiest credits, the most in three years. Though nowhere near their post-crisis highs that exceeded double-digits, spreads are nonetheless flashing red. They’re cautioning investors that the distress emanating from commodity-dependent global economies and signs of a slowing U.S. economy could create enough turbulence to derail one of the most glorious credit cycles in the history of mankind. Aside from macroeconomic indicators, what exactly are spreads tuning into? A recent report by Deutsche Bank’s Oleg Melentyev, whom I’ve known long enough to spell his last name by heart, suggest that the stage is set for the next default cycle. For starters, the current credit cycle is pushing historical boundaries. Going back to the 1980s, high-yield debt creation waves have lasted between four to five and a half years resulting in 53-68 percent debt accumulation from the baseline starting point. Where are we in the current cycle? Over the past four and a half years, junk credits have tacked on 55 percent growth when you take into account the combination of bonds and leveraged loans on bank balance sheets, putting the cycle, “comfortably inside the range of previous cycles,” according to Melentyev. But that’s just one omen. Issuance aggressiveness is another way to test the credit cycle winds. 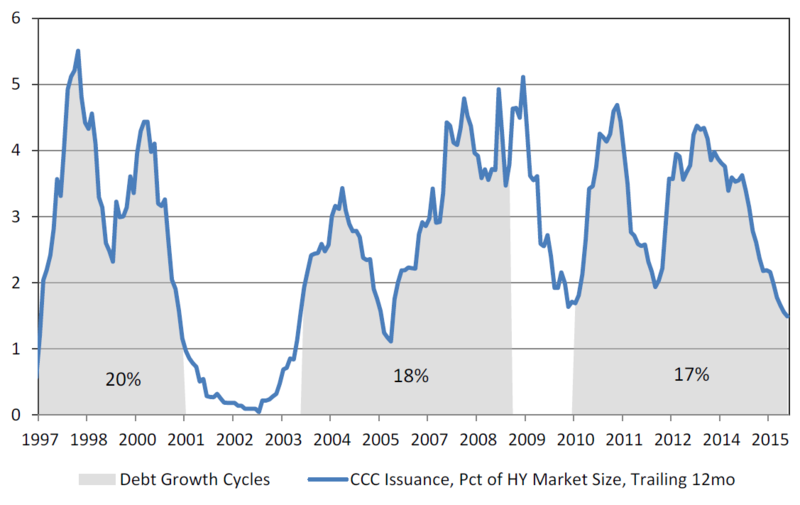 Cumulative credit cycle issuance volumes of companies rated CCC and below, the junkiest of the junk, half of which can be expected to default over the next five years, casts a light on investors’ true pain thresholds. The mid-1990s and the mid-to-late 2000s saw highly toxic issuance swell by 20- and 18-percent, compared to the current cycle’s 17 percent. Melentyev hedges the two metrics’ signals with the caveat that he’s using 2011 as a starting point despite clear evidence that the markets were expanding by the latter half of 2010. Erring on the conservative side, in other words, leads him to the ominous conclusion that, “the pre-requisites for the next default cycle are now in place.” Pre-requisites, though, do not make for certain outcomes though other fundamental benchmarks validate Melentyev’s premise. At the most basic level, companies reassure bond investors by demonstrating they can cover the coupon they’ve promised can be clipped. The higher a company’s credit rating, the greater the probability the firm can make good on its commitment. The question is, what does it say when the presumptive pristine credits that populate the investment grade universe, the ones who disdainfully look down their noses at their lowly junk-rated brethren, begin to emit signs of balance sheet stress? The ratio of debt-to-earnings before interest, taxes, depreciation, amortization and whatever else is left in the kitchen sink for this superior cohort rang in at 2.29 times in this year’s second quarter. That tops the 1.91 clocked in June 2007 before the onset of the financial crisis. So a less cushioned starting point – that is, if this is the starting point and the storm really is fast approaching. There are plenty of guideposts that indicate we haven’t yet arrived at the beginning of the end. Topping the list is the furious merger and acquisition (M&A) activity dominating the news flow. At $3.2 trillion globally, 2015 was already on track to take out the 2007 record of $4.3 trillion in M&A volume. And then the big guns came out. Michael Dell’s ambitions as a private market tech mogul became crystal clear with the announcement that Dell, partnered with Silver Lake, would take out EMC in a $63 billion transaction that requires at least $40 billion in debt to finance. The kicker is that $15 billion would be junk bonds – the biggest of its kind in history. To not be outdone, Anheuser-Busch InBev muscled in to buy SAB Miller with a sweetened $106 billion offer giving new meaning to “This Bid’s for You!” As for the financing to consummate this tie-up? A cool $70 billion in debt financing, a figure that tops Verizon’s one-for-the-history-books $49 billion in bonds that helped pay for its acquisition of Vodafone. In the event these figures have induced a bit of debt indigestion or indignation, rest assured, Standard & Poor’s (S&P), that other mighty credit rating agency, is on the case. In the first nine months of the year, S&P downgraded companies 297 times, the highest pace since that dark year 2009, with liquidity in the bond market one-tenth what it was, caveat clearly emptor. And yet…there’s that sticky issue of the dumb money that’s on the prowl. This is not some reference to a pile of mutual fund “money on the sidelines,” which history has proven can be as ephemeral as a poltergeist you wrongly conclude has been exorcised. Nope – we’re talking about brand-new allocations to the credit markets. Brian Reynolds of New Albion Partners, whose name has graced these pages in the past, helpfully keeps a real time score of the number of public pensions allocating fresh funds to the credit markets since August 2012. His most recent reckoning: 782 votes amounting to $169 billion in new monies being put to work in credit funds. Assuming a conservative five times leverage (which beats the 10-50 leverage multiples deployed in pre-crisis days), some $1.2 trillion in new credit flows have goosed the debt markets since late 2012. What, pray tell, do stock market gyrations the likes of which we’ve seen since August do to pensions’ collective pain thresholds? In a nutshell, it strengthens their resolve to diversify, diversify, diversify away from their stock market exposure. August, September and the first half of October have set a three-month record for new pension allocations. Taking the cake in the “you-just-can’t-make-this-stuff-up” category, the Louisiana Firefighters’ pension is putting $50 million to work in an unconstrained fixed income fund; the funding will be sourced from an equity fund liquidation. On second thought, maybe it’s a good thing they’ve got access to plenty of firehoses. Looking ahead, Moody’s high yield soothsayer Tiina Siilaberg, (I can spell her name from memory as well), sees clear evidence that refunding risk is building in the pipeline. Tiina’s barometer is the credit rating agency’s proprietary index that gauges the future ability of companies to roll over their maturing debt in three years’ time. The last time this indicator was at its current level was in the depth of the 2009-2010 credit crunch. “A significant contributor to the decline in the index is the increase in upcoming maturities. We currently expect $109 billion of speculative-grade bonds maturing over the next three years vs. $88 billion at the beginning of this year.” Indeed, refinancing volumes are down by some 37 percent over the last year. Eric Rosenthal, at Fitch, which rounds out the Big Three credit rating agencies, foresees some messiness in the statistics to come thanks to the degradation of issuer balance sheets coupled with the less-than-friendly refinancing landscape. Rosenthal, whose last name practically spells itself, now expects the corporate bond market default rate will end the year around 3.5 percent and keep moving up in 2016. This rate, he cautions, is materially higher than the 2.1-percent average rate that coincides with non-recessionary times. In an conscious nod to $45 oil, nearly half the energy and metals & mining issues are trading below 80-cents on the dollar (par is 100-cents) compared to seven percent for the whole of the high yield universe. Still, the beat goes on, Rosenthal concedes – which is good news for Michael Dell. Issuance may be down 35 percent over last year for the aforementioned beleaguered commodities space but it’s up three percent for the rest of the junk market. Are the conditions for a meltdown in the bond market firmly in place? Are investors deluding themselves, whistling past the junkyard? Absolutely. But that shouldn’t necessarily keep you up at night, counting the seconds in between lightning flashes and thunderclaps. Or, as Deutsche Bank’s Melentyev’s quips, “A stack of hay is not a fire hazard in and of itself; someone being careless with matches nearby makes it so.” By that same token, Poltergeist’s greedy real estate developer could have ponied up the extra moola to move the coffins of the dead and buried under the subdivision he so profitably erected. Instead, he rolled the demonic dice and simply removed the headstones, whistling past the houses until the unsettled corpses rose through the floorboards, shattering the illusion of suburban serenity. DISCLOSURE: This report is for informational purposes only and does not constitute a solicitation or an offer to buy or sell any securities mentioned herein. This material has been prepared or is distributed solely for informational purposes only and is not a solicitation or an offer to buy any security or instrument or to participate in any trading strategy. All of the recommendations and assumptions included in this presentation are based upon current market conditions as of the date of this presentation and are subject to change. Past performance is no guarantee of future results. All investments involve risk including the loss of principal. All material presented is compiled from sources believed to be reliable, but accuracy cannot be guaranteed. Information contained in this report has been obtained from sources believed to be reliable, Evergreen Capital Management LLC makes no representation as to its accuracy or completeness, except with respect to the Disclosure Section of the report. Any opinions expressed herein reflect our judgment as of the date of the materials and are subject to change without notice. The securities discussed in this report may not be suitable for all investors and are not intended as recommendations of particular securities, financial instruments or strategies to particular clients. Investors must make their own investment decisions based on their financial situations and investment objectives. 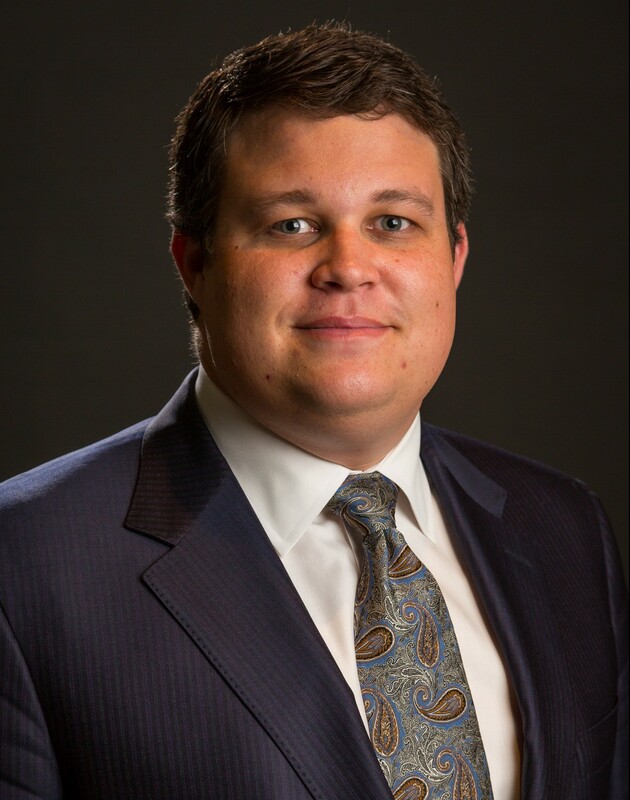 “The specific securities and ETFs identified and described do not represent all of the securities purchased, held, or sold for advisory clients, and you should not assume that investments in the securities were or will be profitable. CVS Corp, General Electric, JP Morgan, Accenture, Vanguard Dividend Appreciation ETF, iShares Core S&P 500 ETF and Powershares S&P 500 Low Volatility ETF are used to illustrate examples of market volatility. You should not assume that an investment in any of these securities was or will be profitable. ECM currently holds CVS, General Electric and JPMorgan, and purchases it for client accounts, if ECM believes that it is a suitable investment for the clients considering various factors, including investment objective and risk tolerance. This actually answered my problem, many thanks!